Root Beer is a favorite enjoyed by the young and old alike so why not treat yourself more often! The types of root beer that exist are extensive and range from favorites from decades ago to gourmet brands and ones created by brew masters who normally create beer. Some root beer can contain alcohol, but the ones I sampled and have displayed do not. 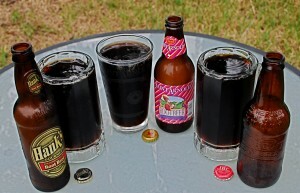 Featured are three versions of Root Beer; Genuine Hank’s® Gourmet Philadelphia Recipe Root Beer, St. Arnold® Hand Crafted Root Beer and IBC® Root Beer Since 1919. Each has a unique flavor and varies in creaminess and how bold the root beer flavor is. If you have a brewery near you see if they make their own brand of root beer, I highly recommend trying one of their hand crafted masterpieces! That is why I featured one from my local brewery – Saint Arnolds. They make one that is so good it is addictive! As I am writing this I am pondering on going over to the fridge and treating myself now! Don’t overlook the brands that have been around for decades either they are still great. For any of those watching their waistline, IBC® has a diet root beer that I think is great and treat myself to quite frequently! Craving a root beer float? Go ahead and add ice cream and chocolate sauce! If you have a favorite brand of root beer please share it with us!